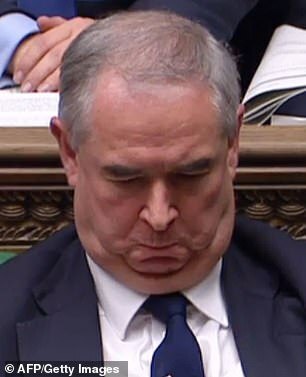 Attorney General Geoffrey Cox winced in Parliament today as MPs voted to hold the government in contempt for the first time in history. He wanted to to keep legal advice on the Brexit deal secret but MPs forced the government to publish it tomorrow. The Commons voted by 311 to 293 to hold ministers in contempt of Parliament after they refused to publish the full advice. 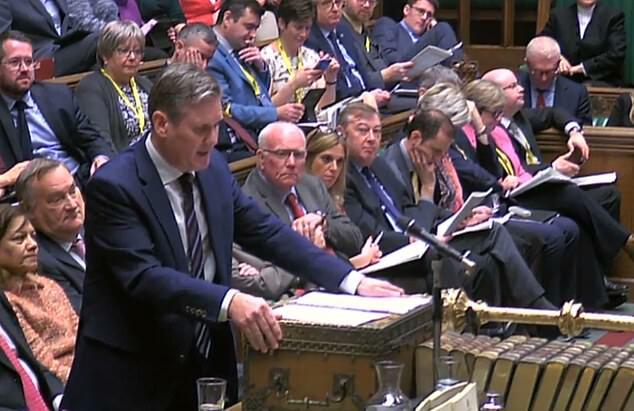 Labour joined with the DUP, SNP and Lib Dems to pass the motion in what Labour’s shadow Brexit secretary Sir Keir Starmer said was an ‘unprecedented’ act. 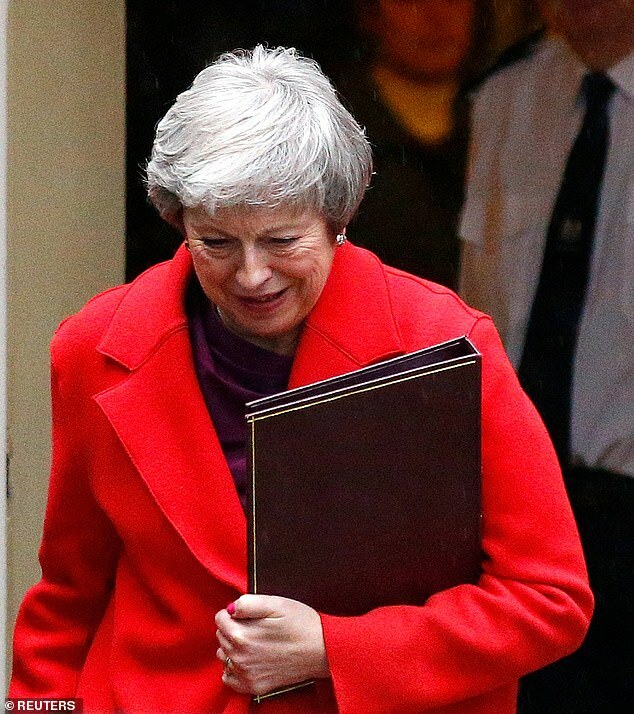 In a torrid night for Theresa May, she suffered another major defeat as MPs voted for an amendment which gives the Commons a greater say if the Brexit deal is defeated on December 11. 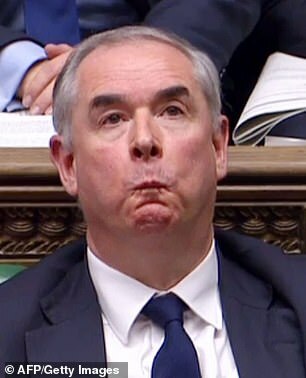 Number Ten ran the risk that ministers – including Mr Cox – could be suspended from the Commons if they continued to refuse to publish the legal advice. Seconds after the vote was announced in the packed Commons chamber, the Government said it will publish the full legal advice tomorrow. But she said she is so alarmed at the use of arcane parliamentary procedure to force ministers to publish secret information, she is asking a committee of MPs to investigate. 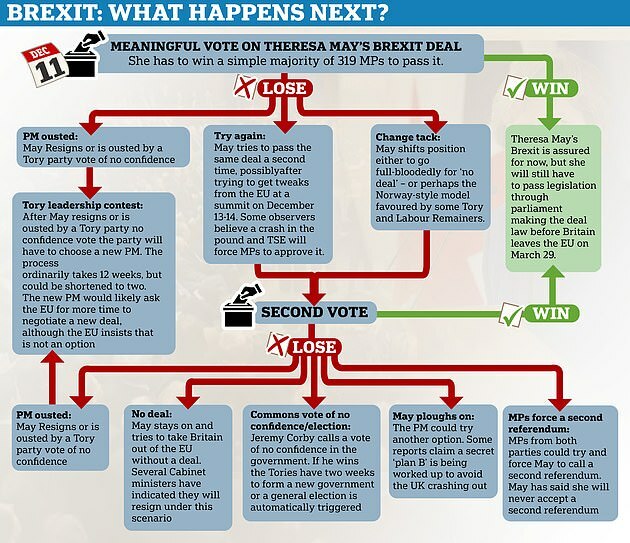 The defeat comes exactly one week before Mrs May faces the biggest political test of her career when MPs will vote on her Brexit deal in the Commons. The dramatic row erupted after the Government refused to publish the full legal advice despite losing a vote in the Commons last month requiring them to. The Speaker has allowed a contempt motion to go before the House after representations from Labour, Tory Brexiteers, the DUP, SNP and Lib Dems. MPs will now vote on whether ministers are ‘in contempt’ and to demand ‘immediate publication’ of the full legal advice. 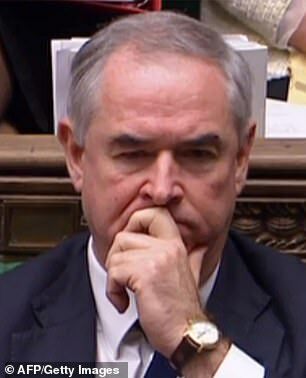 If the vote is carried and the government still refuses to comply, MPs could table another motion to impose a punishment on an individual – most likely Geoffrey Cox – which would potentially be suspension from the House. Ministers have tried to head off the crisis by tabling an amendment that would refer the matter to the Committee of Privileges for detailed consideration. The committee would then recommend a suitable sanction for the Commons to sign off. That is likely to take considerably longer than the week available before MPs vote on the PM’s Brexit deal. Instead they said published a ‘full reasoned position’ laying out a summary of the legal advice. But critics accused ministers of keeping secret the most explosive parts of Mr Cox’s advice. Sir Keir warned that ministers were committing contempt of Parliament and used the arcane parliamentary tactics to heap pressure on No10. If Mrs May had still refused to publish the legal advice then MPs would have debated how to enforce their contempt motion in a debate tomorrow. They could have voted to hold specific named minsters responsible and to mete out punishments to them – including suspending them from Parliament. Cabinet Minister Mrs Leadsom had fiercely defended the Government over the refusal to publish the legal advice. She said the Government was defending an important principle that legal advice should stay confidential. She also insisted MPs should not take it on themselves to rule on whether there had been a contempt – arguing that ministers should have ‘due process’ of an investigation by the Privileges Committee. 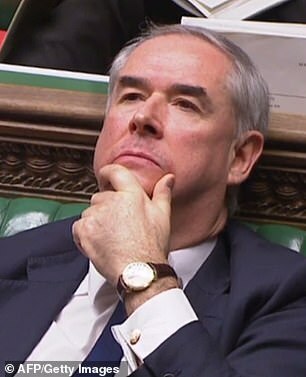 A government-backed amendment to kill off the attempt to hold Mr Cox in contempt by sending the matter to the Privileges Committee was defeated by 311 votes to 307. Kicking off the constitutional clash in the the chamber this afternoon, Sir Keir accused ministers of ignoring a ‘binding motion’ passed by the Commons. ‘That is contempt,’ he said. The standoff between the House and the government is thought to be unprecedented in modern times. Ministers insist legal confidentiality is an important point of principle and revealing the material would hurt the national interest. Instead they published a 40-plus page assessment of the package thrashed out with Brussels. But if the motion is passed today, the pressure to issue the full advice could become unbearable. The PM’s spokesman said she told Cabinet ‘there is a long-standing convention that neither the fact nor the content of law officers’ advice is shared outside Government without their consent’. Mrs Leadsom has written to the Privileges Committee to ask them to investigate the use of arcane parliamentary procedures to force ministers to divulge secret information. Mrs May said that was set out in both Parliament’s Erskine May rulebook and the Ministerial Code. She added ‘it is an essential part of the functioning of government that Cabinet ministers can have access to candid legal advice’ without the fear of it being published. The Government has caved to demands to publish the full legal advice on the Brexit deal after losing an historic vote. 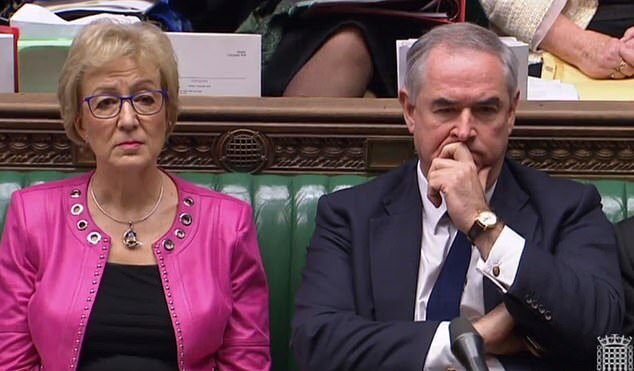 Mrs Leadsom, responding for the government, said Mr Cox had done nothing but treat the House with the ‘utmost respect’ and said he should be given the ‘due process’ of scrutiny by the Privileges Committee. ‘I appeal to all those honourable members across the House that if they seek to pass this motion they should refer it to the committee,’ she said. Tory MP Simon Hoare accused critics of Mrs May’s deal of engaging in ‘parlour games’ rather than focusing on the Brext deal. Mr Rees-Mogg told the Commons he would support the Government, although he did not agree with the dismissal of ‘ancient procedures’ like the humble address being used to hold it to account. He said: ‘I think it’s right that a committee looks at this issue in broad terms because it may be right that the House wishes to take a self-denying ordinance on the extent of humble addresses. But fellow Tory Brexiteer Peter Bone suggested he would support the contempt motion as it would ensure the Government would come forward with a compromise. In extraordinary scenes last night, Speaker John Bercow agreed there was an ‘arguable case that a contempt has been committed’ after Tory Eurosceptics, Labour, the DUP, the SNP and Lib Dems joined forces. The MPs complained that the summary legal advice released by Mr Cox did not comply with a Commons resolution agreed last month. Mr Cox, who is the Government’s chief legal adviser, had staunchly defended the decision to withhold the advice in a marathon appearance in the House – telling MPs ‘there is nothing to see here’. He said that he ‘fully accepts’ MPs may impose a sanction against him or the Government for contempt of Parliament over Brexit legal advice. Mark Carney today admitted his doomsday scenario for a no-deal Brexit meltdown would be unlikely to come to pass. The Bank of England governor said the catastrophic consequences he laid out for a chaotic departure from the bloc – including a deep recession, plunging Pound and spiking unemployment – were a ‘tail risk’. But he also doubled down on the warnings by saying prices of family shopping could rise by 10 per cent – and 6 per cent even if there is an orderly departure. And he delivered a withering verdict on the Norway-style option backed by some Remainers, saying it was ‘highly undesirable’ for the UK. The comments came as Mr Carney gave evidence to MPs on the Treasury Committee. Mr Carney refused to give percentage ‘confidence bands’ for the different scenarios the Bank set out in its dire warnings last week – saying that the committee was better placed to judge how Brexit would pan out. In his statement to MPs, Mr Cox insisted the backstop part of the divorce was ‘expressly agreed not to be intended to establish a permanent relationship but to be temporary’. ‘There is therefore no unilateral right for either party to terminate this arrangement. ‘This means that if no superseding agreement can be reached within the implementation period, the protocol would be activated and in international law would subsist, even if negotiations had broken down. Earlier yesterday, Mrs May’s chief Brexit adviser told MPs that the Northern Ireland border backstop was a ‘slightly uncomfortable necessity’ for both the UK and the European Union.